Each of our clients has a unique and personal view of retirement. 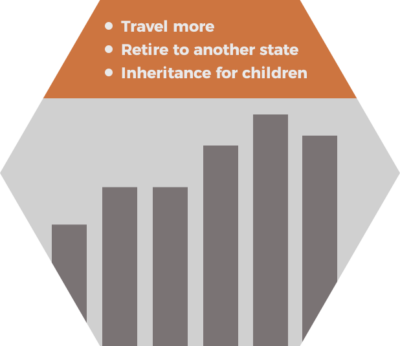 Goals may include traveling more, moving to a new retirement destination, or spending more time with loved ones. Some clients’ views of retirement may involve exiting their current profession and transforming their hobby into a new business. We are passionate about working closely with each individual client in order to assist them in developing a plan to work towards achieving their goals. We do so by evaluating our client’s retirement, savings, investments, and Social Security benefits. We strategize with our clients in order to develop a retirement plan that meets their retirement objectives. After we implement the plans, we closely monitor the accounts and make adjustments accordingly. Some clients start planning for retirement in their 60’s and other clients begin this process in their 30’s. Regardless of where a client is in their life, we thoroughly enjoy helping clients plan for their ultimate retirement goals. Can I save money in an IRA as well as my employer’s 401(k) plan? Yes, you can save money in a Traditional or Roth IRA along with your employer’s 401(k) plan. The current IRS contribution limits apply for your IRA as well as your employer’s 401(k). Can I save money in an IRA for my non-working spouse? If you have a spouse that is a stay-at-home parent or has no earned income from work, you can save into a Roth or Traditional IRA for them. The spousal IRA is an effective way to contribute the maximum amount to IRA’s each year. In order to qualify for a spousal IRA, you have to file jointly as a married couple and the spouse must have enough earned income to fund the IRA. This is a unique question for each family we work with. The answer also varies as particular retirement goals are different for each individual. We meet with our clients and plan for their personal goals by utilizing advanced financial planning software to model their plans and adjust them to meet their goals. This allows our clients to know if they are on track for retirement.